Gift a splash of happiness to brighten up the day of your loved one. This is a combo of a splendid B.. Send this deluxe combo to your special someone today and see what happens tomorrow. 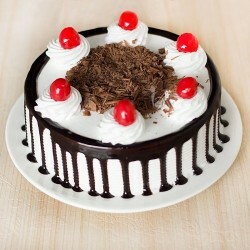 This comprises o..
One Kg Black Forest Cake from Gift My Emotions especially for midnight delivery.Please Note: Every c..